How to create a tropical look in any season with palm trees? Palm trees are known for their tropical island feel. They look stunning, picturesque and can be the finishing touch to a beautiful outdoor space. But did you know palm trees grew in the Arctic? Whilst the Arctic climate has changed, the opportunity to grow and enjoy these beauties have not. What is a palm tree? Palms trees despite the iconic image of a tree with coconuts and palms, can grow in the form of shrubs, woody vines, and trees. The palm tree has over 2,500 species and comes in many shapes, colours and sizes. Many argue that the palm tree originated from Iraq around 50,000 years ago, whilst closest at home Australian scientific findings and an Indigenous legend discovered that the palm has even grown in the Arctic around this same time period. Perhaps the most famous indication of a palm tree though is its fronds, which some people call leaves. There are two main types of palm tree fronds, the pinnate which is shaped like a feather. 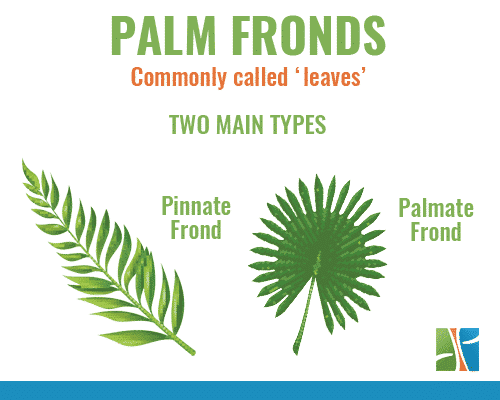 And then there is the palmate frond which is often described as a fan because it is wider in appearance. Palm trees remind us of an island or oceanic view. A tropical appearance that makes us think palm trees all grow coconuts. But they are also famous for growing dates, acai fruit and palm oil from their fruit. Historically, they are also known for their religious symbolism. A palm tree in biblical times represented the victory of a martyr or victory of a spirit over a person’s body. How do you grow palm trees? Unlike other plants out there that grow using a cut off the plant, you can only grow a palm tree with a seed. You can purchase a living seed online or at a local living plant store. Palm seeds need to be fresh to grow quickly. To test if a seed is well, you can place it in warm water. If a seed floats, it lacks some of the nutrients needed to flourish. Once you’ve planted the seeds, place them in a pot plant. The palm tree will need little soil. In tropical islands, these plants grow quickly due to hot climates and with windy conditions. The wind and local animals help to drop the seeds and the palm tree grows. In terms of growth, you can expect palm trees to grow from 70 days after planting the seed, and with some species, this can be up to six months. It’s best to check with your local plant store when purchasing the seed, so you can understand the expectations and whether your palm tree is on the path to growth. All palm trees bar those from the arid region enjoy lots of sunlight and humidity. At the start, your plant will grow with regular servings of water. You can add fertiliser, but only once the plant has started to grow with a few leaves. Again, these requirements do depend on the species of palm tree. What is a sign of an unhealthy palm tree? If you notice your leaves starting to brown, this could be a sign you are not taking good care of the tree. During winter especially during bad weather, you should wrap the trunk with a blanket or plastic sheet. Whilst most palms are wind resistant, they do need protection from cold weather. Can you grow a palm tree indoors in Australia? Yes, you can grow palm trees indoors in Australia. There are living palm trees and artificial palms available that suit the indoor environment. Palm trees that live indoor still need some access to sunlight. They are usually best placed near a window that gets indirect light and they need to be watered each week, depending on their species. Some of the common indoor species available include the parlor palm, fan palm, sentry palm, butterfly palm and the yucca palm. These varieties don’t need sunlight all the time, but should not be in complete darkness – otherwise, they will not grow. Unlike outdoor palm trees, indoor palms are best to be pruned. When the leaves start to change colour, you can prune them back to keep them looking green and luscious in your indoor jungle. Are there low maintenance palm trees? Palm trees will require attention, love, and care. The needs of the tree depend on the type of plant you get. For instance, some varieties need a lot of sunlight, whilst the indoor types can survive with the indirect sun shining through. Though if you live in a place without a window or much brightness, it will be hard to grow a palm tree. They also require water, no matter indoor or out. Whilst they can outlast droughts in other climates, in Australia they tend to require water to survive our weather patterns. For low maintenance palm trees, your best bet is to go with artificial palm tree varieties. We are not referring to cardboard plants, but ones that are made from strong plastic or other materials. 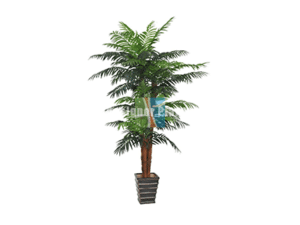 A large tropical palm tree is perfect to brighten up space or create your own oasis. They are designed to suit many spaces, especially an office or living room corner. They will require little to no maintenance, with the only need being to dust them off every once in a while. The fake plant varieties have advanced quite a lot these days and you’d be surprised how lifelike the fake palm tree plants and trunks can be. What do palm trees go with? Palm trees are tropical. So if you want to match palm trees, they are often best delivered with a nautical theme. Commonly you’ll find people plant palm trees near pools or outside on the deck. For inside, palm trees have more flexibility. You can easily get away with having a fake palm tree in your lounge room in the corner or on a table. They are also great to add some colour or ‘life’ to some bedroom decor. And if you want to match the theme of your new tropical oasis, nothing says nautical theme than adding some watercolours, beach decor and some favourites like the pineapple. You can find some pretty neat pineapple lights and storage solutions at a department store or online.